The 2015 World Baseball Softball Confederation (WBSC) Under-18 Baseball World Cup will help "unite the sport’s future stars" ahead of Tokyo 2020’s announcement concerning new sports being added to the Olympic programme, the governing body has claimed. The tournament, scheduled for August 28 to September 6 in Osaka, brings together the world’s top 12 teams at under-18 level and some of the players who will be competing could feature at Tokyo 2020 should baseball and softball be recommended for Olympic inclusion. Japan and the United States, ranked at number one and two in the world respectively, have been drawn together in Group A alongside Australia, Brazil, the Czech Republic and Mexico. World number three ranked Cuba are the favourites in Group B and they will go up against Chinese Taipei, Canada, Italy, South Africa and South Korea. The last Under-18 Baseball World Cup in 2013 in Taichung, Chinese Taipei, where the US beat Japan in the final, had a potential reach of 144 million homes and an online and mobile reach of 20 million. Baseball is the number one sport in Japan in terms of youth participation, infrastructure, media coverage and fan-following, the WBSC claim, and the event will give the sport’s governing body another opportunity to gauge public support in the nation ahead of the Tokyo 2020 Additional Event Programme Panel announcement, which is due in September. Baseball and softball was among the eight sports to present their case for Olympic inclusion to the panel in the Japanese capital last week along with karate, squash, bowling, sport climbing, surfing, roller sports and wushu. Their proposal, made by an eight-strong delegation, included the participation of Major League Baseball players, with WBSC President Riccardo Fraccari emphasising the "added value" adding baseball and softball to the programme would have for the International Olympic Committee (IOC) and Tokyo 2020. 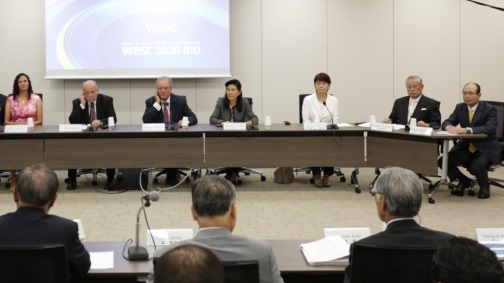 "Given our sport's footprint in Japan and worldwide, WBSC and our global partners hoped to have shown during the interview in Tokyo that staging Olympic baseball and softball in 2020 would be easily accommodated - fully in the spirit of Olympic Agenda 2020 - and the added value as well as the historic value would be a 'home run' for Tokyo 2020, the Olympic Movement and our sport," Fraccari said.